Today marks the first day of the Consumer Financial Protection Bureau (CFPB), a brand-new federal regulatory agency that will supervise and enforce how consumer financial products are offered and provided under federal consumer credit laws. Established by the Dodd-Frank Consumer Financial Protection Act of 2010, the CFPB is the newest, but by no means the only, federal agency with substantial oversight over consumer lending and financial products. While the Federal Reserve Board, the Federal Trade Commission (FTC), the Department of the Treasury and Department of Housing and Urban Development (HUD) still supervise various entities within the consumer finance universe, the CFPB’s authority broadly extends to a wide number of “covered persons” and “service providers” that includes banks, credit unions, securities firms and other financial companies. Notably, the CFPB’s authority extends well beyond depositary institutions, covering such entities as loan modification and foreclosure relief providers, payday lenders and firms that originate or broker loans secured by real estate. With today’s launch of the Consumer Financial Protection Bureau, the landscape of the consumer financial services marketplace has changed dramatically. At the same time, the complexities and nuances of the industry have intensified. If you live in the consumer finance universe, you might benefit from our newly-published book, Consumer Financial Services Answer Book 2011. 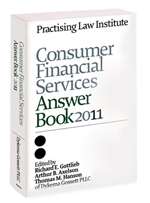 Co-edited by three Dykema members—Richard E. Gottlieb, Arthur B. Axelson and Thomas M. Hanson—with contributions from 18 other Dykema attorneys with expertise in all realms of the consumer financial services sector, this book is a great desk reference, providing easy-to-use guidance in a user-friendly format. This 606-page volume, published by Practising Law Institute, provides answers to questions, basic to complex, facing practitioners and compliance professionals who work within the consumer financial services industry. Although this book has a PLI list price of $235, your first copy is FREE if you are a current Firm client. Additional copies are available to you at substantial volume discounts. Let your Dykema contact know if you would like a copy. For more information about Dykema's Consumer Financial Services practice, please contact one of the listed attorneys, or your Dykema relationship attorney.